Inspired by trees, this cast stone birdbath makes a wonderful centerpiece for gardens and backyards. This rustic birdbath makes a great addition to gardens or flower beds. Cast stone in an oak finish is detailed to look like a carved tree stump while birds and flowers decorate the bottom of the stand. You'll love the distinctive look and serene charm of this fantastic water feature. Henri Studio was started more than 40 years ago when Tuscan sculptor Eneri Prosperi came to the U.S.A. He combined master hand-sculpting techniques with cast stone, a highly dense material with a texture similar to limestone. Made from a special cement blend of coarse and fine minerals, pigments, and water, it is enriched by exclusive finishes that convey vivid natural stone highlights in subtle organic tones. Please note this hand-crafted, custom made-to-order design ships for free, but may require freight curbside delivery due to its size and weight. 25" high x 19" wide. Weighs 83 lbs. Cast stone bird bath. Relic lava finish. Due to its hand-crafted nature, each will vary slightly. I have many wild plants. This birdbath looks like wood and the price is good. Others are selling same birdbath for $199.99 to $435.99. This will go nicely next to my Henri Studio tall birdhouse. Later I plan to buy the mushrooms, if I have enough room. Though, I don't want the area I'm redoing to look too cuties or overdone. Looks beautiful, well made and fits into the yard unobtrusively. I like that it looks natural, like wood, and it isn't too deep. I'm putting it in what I call a secret garden. Will the withstand a snowy, icy winter? BEST ANSWER: Hi - For areas where there are freezing temperatures, it is recommended to drain the birdbath completely of water and store covered (preferably inside your garage or covered area). 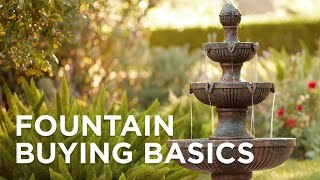 I have added a helpful link below with several tips for winterizing your fountain. I don’t see why not. It’s actually made of stone and is amazingly strong and durable. My customer and I are very pleased with both how well made and beautiful it is. Yes, at my house at least. The ice is frozen now and filled with snow. No problem so far. How heavy is it? I am looking for a birdbath that is heavy in weight and can stand on it's own in outside conditions. BEST ANSWER: Hi - this design weighs 83 lbs. It is quite substantial and will be able to stand on its own. It weighs and can stand on its own outside. It is not resin. It is cast stone. You will be very pleased with this. The colors are very natural looking. It can stand on its own outdoors and looks quite natural and beautiful. It fits in to a natural setting very well. This birdbath is cast stone and looks like natural wood. It fits in to a natural setting very well and is priced very reasonably. I would buy it again. Absolutely beautiful! Well worth the wait (1 month) for a made-to-order item! We live in the woods - and it looks like it grew in place. Base is nicely decorated (Carved//cast mouse & squirrel are a nice touch).